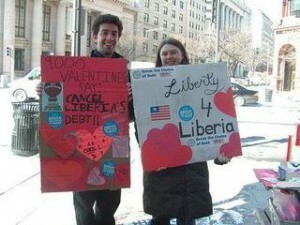 For years, Jubilee USA and tens of thousands of supporters have been calling for immediate debt cancellation for Liberia, and helped secure financing to clear the nation’s arrears to the IMF in 2007. Finally those calls have been heard. On June 29, Liberia, the world’s most indebted country relative to its income, had its debt canceled. The nation’s foreign debt levels had sometimes reached over 1,000% of its Gross National Income over the last 10 years. Just to settle its debt, Liberia would have had to pay creditors its $350 million budget for 28 years. Thankfully, this won’t have to happen. The country received $4.9 billion in irrevocable debt relief from the IMF, World Bank, African Development Bank, and bilateral creditors, canceling 90% of its debt. This victory was made possible with support throughout the world and the courageous and determined leadership of President Sirleaf’s administration. The administration faced many difficult challenges in meeting the conditions imposed on them to meet completion point since it only controlled 10% of the Liberian Congress – but the President persevered and passed such legislation as the establishment of the Anti-Corruption Commission. In a country where 84% of the population lives in extreme poverty and is among the poorest 20 countries in the world, the achievement of debt cancellation demonstrates the power of a nation’s determination to rise up out of oppressive debt. But there are still challenges to be faced: Liberia owes Kuwait $12 million for the building of a road, and further steps also need to be taken to ensure that revenue from Liberia’s natural resources is used to fund the country’s reconstruction and not lost to corruption. Yet even with these obstacles it has to face, the nation looks ahead – with the debt burden gone, the government plans to “use all its resources to undertake development projects such as the building of schools and health facilities across the country.” The top project on the nation’s agenda is the restoration of infrastructure, particularly roads. Doing so will most likely result in the necessity of new loans for funding, but the President affirms that new loans would fully go towards infrastructure development. With these actions, it seems that Liberia will become another example of how debt relief can be a successful tool for reducing poverty.